Today being Thanksgiving, we decided to post a story of one of the “Most Famous Feasts” in recent Vaisnava history, cooked by the wife of Advaita Acarya, Sita. Followed by the song composed by Srila Bhaktivinoda Thakura, “Prasada-sevya part 2” honoring this event. Saying this, Śrī Advaita Ācārya took the Lord into the boat and brought the Lord to His residence. There Advaita Ācārya washed the feet of the Lord and was consequently very happy within. All the eatables were first cooked by the wife of Advaita Ācārya. Then Śrīla Advaita Ācārya personally offered everything to Lord Viṣṇu. This is the ideal householder’s life. The husband and wife live together, and the husband works very hard to secure paraphernalia for worshiping Lord Viṣṇu. The wife at home cooks a variety of foods for Lord Viṣṇu, and the husband offers it to the Deity. After that, ārati is performed, and the prasāda is distributed amongst family members and guests. According to the Vedic principles, there must always be a guest in a householder’s house. In my childhood I have actually seen my father receive not less than four guests every day, and in those days my father’s income was not very great. Nonetheless, there was no difficulty in offering prasāda to at least four guests every day. According to Vedic principles, a householder, before taking lunch, should go outside and shout very loudly to see if there is anyone without food. In this way he invites people to take prasāda. If someone comes, the householder offers him prasāda, and if there is not much left, he should offer his own portion to the guest. If no one responds to his call, the householder can accept his own lunch. Thus the householder’s life is also a kind of austerity. Because of this, the householder’s life is called the gṛhastha-āśrama. Although a person may live with his wife and children happily in Kṛṣṇa consciousness, he also observes the regulative principles followed in any temple. If there is no Kṛṣṇa consciousness, the householder’s abode is called a gṛhamedhī’s house. Householders in Kṛṣṇa consciousness are actually gṛhasthas-that is, those living in the āśrama with their families and children. Śrī Advaita Prabhu was an ideal gṛhastha, and His house was the ideal gṛhastha-āśrama. All the prepared food was divided into three equal parts. One part was arranged on a metal plate for offering to Lord Kṛṣṇa. The word bāḍāila, meaning “increased,” is very significant in this verse. It is a sophisticated word used by the gṛhasthas in Bengal. Whenever food is prepared and we take away a portion, the food is actually decreased. But here it is the system to say bāḍāila, or “increased.” If food is prepared for Kṛṣṇa and offered to Him and the Vaiṣṇavas, the stock is increased, never decreased. Of the three divisions, one was arranged on a metal plate, and the other two were arranged on plantain leaves. These leaves were not bifurcated, and they were taken from a banana tree that held at least thirty-two bunches of bananas. The two plates were filled very nicely with the kinds of food described below. The cooked rice was a stack of very fine grains nicely cooked, and in the middle was yellow clarified butter from the milk of cows. Surrounding the stack of rice were pots made of the skins of banana trees, and in these pots were varieties of vegetables and mung dāl. Among the cooked vegetables were paṭolas, squash, mānakacu and a salad made with pieces of ginger and various types of spinach. There was sukhta, bitter melon mixed with all kinds of vegetables, defying the taste of nectar. There were five types of bitter and pungent sukhtas. Amongst the various vegetables were newly grown leaves of nimba trees fried with eggplant. The fruit known as paṭola was fried with phulabaḍi, a kind of dāl preparation first mashed and then dried in the sun. There was also a preparation known as kuṣmāṇḍa-mānacāki. We request our editors of cook books to add all these nice preparations described by the experienced author Śrīla Kavirāja Gosvāmī. The preparation made with coconut pulp mixed with curd and rock candy was very sweet. There was a curry made of banana flowers and squash boiled in milk, all in great quantity. There were small cakes in sweet and sour sauce and five or six kinds of sour preparations. All the vegetables were so made that everyone present could take prasāda. There were soft cakes made with mung dāl, soft cakes made with ripe bananas, and soft cakes made with urad dāl. There were various kinds of sweetmeats, condensed milk mixed with rice cakes, a coconut preparation and every kind of cake desirable. All the vegetables were served in pots made of banana leaves taken from trees producing at least thirty-two bunches of bananas. These pots were very strong and big and did not tilt or totter. All around the three eating places were a hundred pots filled with various kinds of vegetables. Along with the various vegetables was sweet rice mixed with ghee. This was kept in new earthen pots. Earthen pots filled with highly condensed milk were placed in three places. Besides the other preparations, there were chipped rice made with milk and mixed with bananas, and also white squash boiled in milk. Indeed, it is not possible to describe all the preparations that were made. In two places there were earthen pots filled with another preparation made with yogurt, sandeśa [a sweetmeat made with curd] and banana. I am unable to describe it all. Upon the stack of boiled rice and all the vegetables were flowers of the tulasī trees. There were also pots filled with scented rosewater. There were three sitting places where soft cloths were placed. Thus Lord Kṛṣṇa was offered all the food, and the Lord took it very pleasantly. It is the system, after offering food, to perform bhoga-ārati. Advaita Prabhu asked the two brothers, Lord Caitanya Mahāprabhu and Nityānanda Prabhu, to come see the ārati. The two Lords and all others present went to see the ārati ceremony. After ārati was performed for the Deities in the temple, Lord Kṛṣṇa was made to lie down to rest. Advaita Ācārya then came out to submit something to Lord Caitanya Mahāprabhu. Śrī Advaita Prabhu said, “My dear Lords, kindly enter this room.” The two brothers, Caitanya Mahāprabhu and Nityānanda Prabhu, then came forward to take the prasāda. When Lord Śrī Caitanya Mahāprabhu and Nityānanda Prabhu went to accept the prasāda, They both called Mukunda and Haridāsa to come with Them. However, Mukunda and Haridāsa, both with folded hands, spoke as follows. Although the Hindus and Muslims lived together in a very friendly manner, still there were distinctions between them. The Muslims were considered yavanas, or low-born, and whenever a Muslim was invited, he would be fed outside of the house. Although personally called by Śrī Caitanya Mahāprabhu and Nityānanda Prabhu to take prasāda with Them, still, out of great humility, Haridāsa Ṭhākura submitted, “I shall take the prasāda outside of the house.” Although Haridāsa Ṭhākura was an exalted Vaiṣṇava accepted by Advaita Ācārya, Nityānanda Prabhu and Śrī Caitanya Mahāprabhu, nonetheless, in order not to disturb social tranquillity, he humbly kept himself in the position of a Muslim, outside the jurisdiction of the Hindu community. Therefore he proposed to take prasāda outside the house. Although he was in an exalted position and equal to other great Vaiṣṇavas, he considered himself a pāpiṣṭha, a most sinful man, and adhama, the lowest among men. Although a Vaiṣṇava may be very much advanced spiritually, he keeps himself externally humble and submissive. Advaita Ācārya took Lord Nityānanda Prabhu and Lord Caitanya Mahāprabhu within the room, and the two Lords saw the arrangement of the prasāda. Śrī Caitanya Mahāprabhu was especially very much pleased. Śrī Caitanya Mahāprabhu was pleased because He saw how nicely so many varieties of food were prepared for Kṛṣṇa. Actually all kinds of prasāda are prepared for Kṛṣṇa, not for the people, but the devotees partake of prasāda with great pleasure. When Śrī Caitanya Mahāprabhu entered the room, He saw three divisions of food, and He knew that all of these were meant for Kṛṣṇa. However, He did not understand the intentions of Advaita Ācārya. Śrīla Bhaktisiddhānta Sarasvatī Ṭhākura states that one of these servings was offered in a metal dish and was meant for Kṛṣṇa, whereas the other two were placed on big banana leaves. The offering on the metal plate was personally offered by Advaita Ācārya to Kṛṣṇa. The other two servings, on banana leaves, were to be accepted by Śrī Caitanya Mahāprabhu and Lord Nityānanda. That was Advaita Ācārya’s intention, but He did not disclose this to Śrī Caitanya Mahāprabhu. Thus when Śrī Caitanya Mahāprabhu saw the food offered in three places, He thought that all of it was meant for Kṛṣṇa. Advaita Ācārya said, “Just sit down here on these seats.” Catching Their hands, He sat Them both down. The word upakaraṇa indicates a variety of foods, such as dāl, vegetables and other varieties of possible dishes that one can eat very nicely with rice. It is not proper, however, for a sannyāsī to eat such palatable dishes. If he did so, he would not be able to control his senses. Śrī Caitanya Mahāprabhu did not encourage sannyāsīs to eat very palatable dishes, for the whole Vaiṣṇava cult is vairāgya-vidyā, as renounced as possible. Caitanya Mahāprabhu also advised Raghunātha dāsa Gosvāmī not to eat very palatable dishes, wear very nice garments or talk on mundane subjects. These things are all prohibited for those in the renounced order. A devotee does not accept anything to eat that is not first offered to Kṛṣṇa. All the rich foods offered to Kṛṣṇa are given to the gṛhasthas, the householders. There are many nice things offered to Kṛṣṇa-garlands, bedsteads, nice ornaments, nice food and even nicely prepared pan, betel nuts-but a humble Vaiṣṇava, thinking his body material and nasty, does not accept such preparations for himself. He thinks that by accepting such things he will offend the lotus feet of the Lord. Those who are sahajiyās cannot understand what Śrī Caitanya Mahāprabhu meant when He asked Advaita Ācārya to bring two separate leaves and give a small quantity of the prasāda to Him. Advaita Ācārya then requested the Lord to simply accept the prasāda without pretense. If He could not eat it all, the balance could be left on the plate. In this connection Advaita Ācārya referred to Caitanya Mahāprabhu’s eating at Jagannātha Purī. Lord Jagannātha and Śrī Caitanya Mahāprabhu are identical. Advaita Ācārya pointed out that at Jagannātha Purī Caitanya Mahāprabhu ate fifty-four times a day, and each time He ate many hundreds of pots of food. Upon saying this, Advaita Ācārya supplied water to the two Lords so that They could wash Their hands. The two Lords then sat down and, smiling, began to eat the prasāda. Advaita Ācārya replied, “Sir, You are a mendicant traveling on pilgrimage. Sometimes You eat fruits and roots, and sometimes You simply go on fasting. His Divine Grace Advaita Ācārya, after hearing the statement of Nityānanda Prabhu, took the opportunity presented by the joking words and spoke to Him as follows. There is always a difference of opinion between a smārta-brāhmaṇa and a Vaiṣṇava gosvāmī. There are even smārta opinions and Vaiṣṇava gosvāmī opinions available in astrological and astronomical calculations. By calling Nityānanda Prabhu a bhraṣṭa avadhūta (a rejected paramahaṁsa), Advaita Ācārya Prabhu in a sense accepted Nityānanda Prabhu as a paramahaṁsa. In other words, Nityānanda Prabhu had nothing to do with the rules governing smārta-brāhmaṇas. Thus under pretense of condemning Him, Advaita Ācārya was actually praising Him. In the avadhūta stage, the paramahaṁsa stage, which is the supermost stage, one may appear to be viṣayī, on the platform of sense gratification, but in actuality he has nothing to do with sense gratification. At that stage, a person sometimes accepts the symptoms and dress of a sannyāsī and sometimes does not. Sometimes he dresses like a householder. We should know, however, that these are all joking words between Advaita Ācārya and Nityānanda Prabhu. They are not to be taken as insults. In Khaḍadaha, sometimes people misunderstood Nityānanda Prabhu to belong to the śākta-sampradāya, whose philosophy is antaḥ śāktaḥ bahiḥ śaivaḥ sabhāyāṁ vaiṣṇavo mataḥ. According to the śākta-sampradāya, a person called kaulāvadhūta thinks materially while externally appearing to be a great devotee of Lord Śiva. When such a person is in an assembly of Vaiṣṇavas, he appears like a Vaiṣṇava. Actually Nityānanda Prabhu did not belong to such a community. 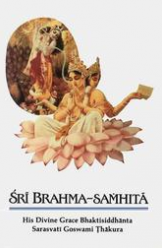 Nityānanda Prabhu was always a brahmacārī of a sannyāsī of the vaidika order. Actually He was a paramahaṁsa. Sometimes He is accepted to be a disciple of Lakṣmīpati Tīrtha. If He is so accepted, Nityānanda Prabhu belonged to the Madhva-sampradāya. He did not belong to the tāntrika-sampradāya of Bengal. Advaita Ācārya accused Nityānanda Prabhu, saying, “You can eat ten to twenty mānas of rice. I am a poor brāhmaṇa. How shall I get so much rice? A māna is a measurement containing about four kilos. In this way, Nityānanda Prabhu and Lord Caitanya Mahāprabhu ate and talked with Advaita Ācārya jokingly. After eating half of each vegetable preparation given to Him, Śrī Caitanya Mahāprabhu abandoned it and went on to the next. As soon as half of the vegetable in the pot was finished, Advaita Ācārya filled it up again. In this way, as the Lord finished half of a preparation, Advaita Ācārya again and again filled it up. After saying this, Nityānanda Prabhu took a handful of rice and threw it on the floor in front of Him, as if He were angry. When two or four pieces of the thrown rice touched His body, Advaita Ācārya began to dance in various ways with the rice still stuck to His body. When the rice thrown by Nityānanda Prabhu touched His body, Advaita Ācārya thought Himself purified by the touch of remnants thrown by Paramahaṁsa Nityānanda. Therefore He began dancing. The word avadhūta refers to one above all rules and regulations. Sometimes, not observing all the rules and regulations of a sannyāsī, Nityānanda Prabhu exhibited the behavior of a mad avadhūta. He threw the remnants of food on the ground, and some of these remnants touched the body of Advaita Ācārya. Advaita Ācārya accepted this happily because He presented Himself as a member of the community of smārta-brāhmaṇas. By touching the remnants of food thrown by Nityānanda Prabhu, Advaita Ācārya immediately felt Himself purified of all smārta contamination. The remnants of food left by a pure Vaiṣṇava are called mahā-mahā-prasāda. This is completely spiritual and is identified with Lord Viṣṇu. Such remnants are not ordinary. The spiritual master is to be considered on the stage of paramahaṁsa and beyond the jurisdiction of the varṇāśrama institution. The remnants of food left by the spiritual master and similar paramahaṁsas or pure Vaiṣṇavas are purifying. When an ordinary person touches such prasāda, his mind is purified, and his mind is raised to the status of a pure brāhmaṇa. The behavior and statements of Advaita Ācārya are meant for the understanding of ordinary people who are unaware of the strength of spiritual values, not knowing the potency of food left by the bona fide spiritual master and pure Vaiṣṇavas. Advaita Ācārya jokingly said, “My dear Nityānanda, I invited You, and indeed I have received the results. You have no fixed caste or dynasty. By nature You are a madman. The words sahaje pāgala (“by nature a madman”) indicate that Nityānanda Prabhu was transcendentally situated on the paramahaṁsa stage. Because He always remembered Rādhā-Kṛṣṇa and Their service, this was transcendental madness. Śrī Advaita Ācārya was pointing out this fact. The words āpanāra sama indicate that Advaita Ācārya considered Himself to belong to the smārta-brāhmaṇas, and He considered Nityānanda Prabhu to be on the transcendental stage with pure Vaiṣṇavas. Lord Nityānanda gave Advaita Ācārya His remnants to situate Him on the same platform and make Him a pure unalloyed Vaiṣṇava or paramahaṁsa. Advaita Ācārya’s statement indicates that a paramahaṁsa Vaiṣṇava is transcendentally situated. A pure Vaiṣṇava is not subject to the rules and regulations of the smārta-brāhmaṇas. That was the reason for Advaita Ācārya’s stating, āpanāra sama more karibāra tare: “to raise Me to Your own standard.” A pure Vaiṣṇava, or a person on the paramahaṁsa stage, accepts the remnants of food (mahā-prasāda) as spiritual. He does not consider it to be material or sense gratificatory. He accepts mahā-prasāda not as ordinary dāl and rice but as spiritual substance. To say nothing of the remnants of food left by a pure Vaiṣṇava, prasāda is never polluted even if it is touched by the mouth of a caṇḍāla. Indeed, it retains its spiritual value. Therefore by eating or touching such mahā-prasāda, a brāhmaṇa is not degraded. There is no question of being polluted by touching the remnants of such food. Actually, by eating such mahā-prasāda, one is freed from all the contaminations of the material condition. That is the verdict of the śāstra. In the Bṛhad-viṣṇu Purāṇa it is stated that one who considers mahā-prasāda to be equal to ordinary rice and dāl certainly commits a great offense. Ordinary edibles are touchable and untouchable, but there are no such dualistic considerations where prasāda is concerned. prasāda is transcendental, and there are no transformations or contaminations, just as there are no contaminations or transformations in the body of Lord Viṣṇu Himself. Thus even if one is a brāhmaṇa he is certain to be attacked by leprosy and bereft of all family members if he makes such dualistic considerations. Such an offender goes to hell, never to return. This is the injunction of the Bṛhad-viṣṇu Purāṇa. After this, Advaita Ācārya made the Lords wash Their hands and mouths. He then took Them to a nice bed and made Them lie down to take rest. Śrī Advaita Ācārya fed the two Lords cloves and cardamom mixed with tulasī flowers. Thus there was a good flavor within Their mouths. Śrī Advaita Ācārya then smeared the bodies of the Lords with sandalwood pulp and then placed very fragrant flower garlands on Their chests. When the Lord lay down on the bed, Advaita Ācārya waited to massage His legs, but the Lord was very hesitant and spoke as follows to Advaita Ācārya. Thereupon Advaita Ācārya took prasāda with Mukunda and Haridāsa, and they all wholeheartedly ate as much as they desired. When the people of Śāntipura heard that Lord Śrī Caitanya Mahāprabhu was staying there, they all immediately came to see His lotus feet. Being very pleased, all the people loudly began to shout the holy name of the Lord, “Hari! Hari!” Indeed, they became struck with wonder upon seeing the beauty of the Lord. They saw Śrī Caitanya Mahāprabhu’s very fair-complexioned body and its bright luster, which conquered the brilliance of the sun. Over and above this was the beauty of the saffron garments that glittered upon His body. People came and went with great pleasure. There was no calculating how many people assembled there before the day was over. As soon as it was evening, Advaita Ācārya began the congregational chanting. He even began to dance Himself, and the Lord saw the performance. When Advaita Ācārya began to dance, Nityānanda Prabhu began dancing behind Him. Haridāsa Ṭhākura, being very pleased, also began dancing behind Him. This is a song composed by Vidyāpati. Sometimes the word mādhava is misunderstood to refer to Mādhavendra Purī. Advaita Ācārya was a disciple of Mādhavendra Purī, and consequently some people think that He was referring to Mādhavendra Purī by using the word mādhava. But actually this is not the fact. This song was composed to commemorate the separation of Kṛṣṇa from Rādhārāṇī during Kṛṣṇa’s absence in Mathurā. It is thought that this song was sung by Śrīmatī Rādhārāṇī when Kṛṣṇa returned. It is technically called Mathurā-viraha. Advaita Ācārya led the saṅkīrtana party, and with great pleasure He sang this verse. There was a manifestation of ecstatic perspiration, shivering, raised hairs, tears in the eyes and sometimes thundering and bellowing. While dancing, Advaita Ācārya would sometimes turn around and around and catch the lotus feet of Śrī Caitanya Mahāprabhu. Advaita Ācārya would then speak to Him as follows. So speaking, Advaita Ācārya performed congregational chanting with great pleasure for three hours that night and danced all the time. When Advaita Ācārya danced in that way, Lord Caitanya felt ecstatic love for Kṛṣṇa, and because of His separation, the waves and flames of love increased. Being agitated by the ecstasy, Śrī Caitanya Mahāprabhu suddenly fell to the ground. Seeing this, Advaita Ācārya stopped dancing. When Mukunda saw the ecstasy of Śrī Caitanya Mahāprabhu, he understood the feelings of the Lord and began to sing many stanzas augmenting the force of the Lord’s ecstasy. Advaita Ācārya raised the body of Śrī Caitanya Mahāprabhu to help Him dance, but the Lord, after hearing the stanzas sung by Mukunda, could not be held due to His bodily symptoms. Tears fell from His eyes, and His whole body trembled. His hair stood on end, He perspired heavily, and His words faltered. Sometimes He stood, and sometimes He fell. And sometimes He cried. Mukunda sang, ” ‘My dear intimate friend! What has not happened to me! Due to the effects of the poison of love for Kṛṣṇa, my body and mind have been severely afflicted. When Mukunda saw that Caitanya Mahāprabhu was feeling ecstatic pain and manifesting ecstatic bodily symptoms, all due to feelings of separation from Kṛṣṇa, he sang songs about meeting with Kṛṣṇa. Advaita Ācārya also stopped dancing. This stanza was sung by Mukunda in a very sweet voice, but as soon as Caitanya Mahāprabhu heard this stanza, His mind went to pieces. The transcendental ecstatic symptoms of disappointment, moroseness, pleasure, restlessness, pride and humility all began to fight like soldiers within the Lord. Harṣa is described in the Bhakti-rasāmṛta-sindhu. Harṣa is experienced when one finally attains the desired goal of life and consequently becomes very glad. When harṣa is present, the body shivers, and one’s bodily hairs stand on end. There are perspiration, tears and an outburst of passion and madness. The mouth becomes swollen, and one experiences inertia and illusion. When a person attains his desired object and feels very fortunate, the luster of his body increases. Because of his own qualities and feelings of greatness, he does not care for anyone else, and this is called garva, or pride. In this condition one utters prayers and does not reply to others’ inquiries. Seeing one’s own body, concealing one’s desires and not heeding the words of others are symptoms visible in the ecstasy of garva. The entire body of Lord Śrī Caitanya Mahāprabhu began to totter due to the onslaught of various ecstatic symptoms. As a result, He immediately fell on the ground, and His breathing almost stopped. Upon seeing the condition of the Lord, all the devotees became very anxious. Then, suddenly, the Lord got up and began to make thundering sounds. Upon standing up, the Lord said, “Go on speaking! Go on speaking!” Thus He began to dance, overwhelmed with pleasure. No one could understand the strong waves of this ecstasy. Lord Nityānanda began to walk with Caitanya Mahāprabhu to see that He would not fall, and Advaita Ācārya and Haridāsa Ṭhākura followed Them, dancing. In this way the Lord danced for at least three hours. Sometimes the symptoms of ecstasy were visible, including pleasure, moroseness and many other waves of ecstatic emotional love. The Lord had been fasting for three days, and after that period He took eatables sumptuously. Thus when He danced and jumped high, He became a little fatigued. Being fully absorbed in love of Godhead, He would not understand His fatigue. But Nityānanda Prabhu, catching Him, stopped His dancing. Although the Lord was fatigued, Nityānanda Prabhu kept Him steady by holding Him. At that time Advaita Ācārya suspended the chanting and, by rendering various services to the Lord, made Him lie down to take rest. For ten continuous days Advaita Ācārya held feasting and chanting in the evening. He served the Lord in this way without any change. 1) O brothers! One day at Sri Advaita’s house in santipura, the two Lords-Caitanya and Nityananda-were seated for lunch. Lord Caitanya tasted the green leafy vegetable preparation and addressed the assembly of His devotees, “This sak is so delicious! Lord Krsna has definitely tasted it.